HURRICANE — A commercial vehicle was completely engulfed in flames on State Street in Hurricane Thursday afternoon. 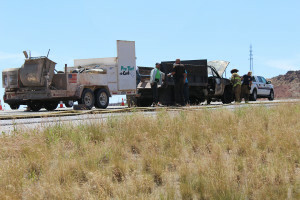 At about 2:29 p.m., the Hurricane City Police Department, Hurricane City Fire Department and Utah Highway Patrol responded to reports of a vehicle fire near the intersection of 5300 West and State Street, Hurricane City Police Sgt. Brandon Buell said. The 31-year-old driver of a GMC 2500 truck told police officers he heard a loud bang when he stopped at the traffic light at that intersection, then another bang when he tried to drive from the light. The driver tried to pull off to the side of the road and, as he did that, he saw smoke coming from his vehicle. There were no passengers in the truck, and the driver did not report any injuries. Because of extensive damage to the vehicle from the fire, the GMC was towed from the scene. The Washington County Sheriff’s Office responded to redirect traffic out of both westbound lanes into the center lane for about an hour. Although the cause of the fire is unknown as this report is published, Buell said, police suspect it was due to a transmission failure.